Every year, Cathay Pacific onboards hundreds of new employees. To remain one of world’s leading airlines, every one of those new starters have to deliver their signature customer service from the moment they join. To help achieve that goal, Cathay Pacific embarked on a project to give their every single new employee a consistent and engaging onboarding experience. But getting new employees to absorb a lot of information — especially before they start on day one — is a big ask. Layer in the complexity of different role types, experience levels, locations and cultures, and Cathay Pacific would need a creative way to motivate new hires to explore all of the onboarding resources available to them. Enter gamification. Using Willow, they designed a gamified onboarding experience that keeps new employees engaged and learning from the time they sign their contract all the way through to their first performance review. So how did they do this? And why gamification? First, a quick definition. Gamification is the application of mechanics which make games fun and addictive to non-game experiences. In the workplace, this can be anything from employee onboarding to coaching and development. Depending on what you’re trying to achieve, gamification can include things like points, badges, leaderboards, rewards, communities, collaboration on tasks, and status levels. It can be a powerful tool to motivate employees while increasing the usage and adoption of new tools and processes. Equal amounts have been written about its power in the workplace as its failures to achieve the desired outcomes. But when carefully thought out, gamification is proven to increase engagement and boost productivity. It can also provide a tool for employee recognition, and even improve knowledge retention. Onboarding, in particular, is an area that can benefit from gamification. Too often, onboarding is viewed as a utilitarian process, filled with boring instructional manuals, compliance requirements, forms, and questionably helpful training sessions. For hiring managers and new employees alike, it can be more of a chore than a positive experience. But it’s what sets the stage for an employee’s entire career with your organization, and their relationship with their hiring manager and coworkers. Gamification, when paired with relevant content and clear expectations for both sides, can bring employees into the community, motivate them to learn and participate more, and reward them while getting them up to speed faster. But gamifying for the sake of it doesn’t solve the problem of engagement. Its power is rooted in human psychology and it needs to be carefully designed in order to tap into the motivations of your employees and reap the benefits. As Gartner’s Brian Burke points out in his book Gamify, gamification is not about making boring activities fun by adding points, badges, and leaderboards. Instead, it’s centered on the science of motivation. Before you even start thinking about how to gamify onboarding tasks, start first by understanding your employees’ goals and ambitions. Gamification won’t motivate people to do things they don’t want to do. Gartner estimates that 80% of workplace gamification falls flat due to a lack of creativity and meaning. By tapping into intrinsic forms of motivation (like competence, autonomy, and emotional needs), rather than extrinsic rewards (incentives), you can encourage people to participate more, and for longer periods. For example, consider online community Stack Overflow. Members are rewarded through upvoting and feedback for contributing answers to other people’s questions, benefiting both the answerer and the asker. As people answer more questions, not only do they acquire elevated status, they also become part of a community and begin to develop positive social reputations. As in the example above, organizations need to consider the motivations not only of new starters but also of the people supporting them. Often this is a large and diverse group that includes recruiters, hiring managers, HR, onboarding buddies, other new starters, and peers. Is there a way to involve them in the experience that will make it better for new employees? Consider the whole onboarding ecosystem and design ways to motivate and engage everyone involved. 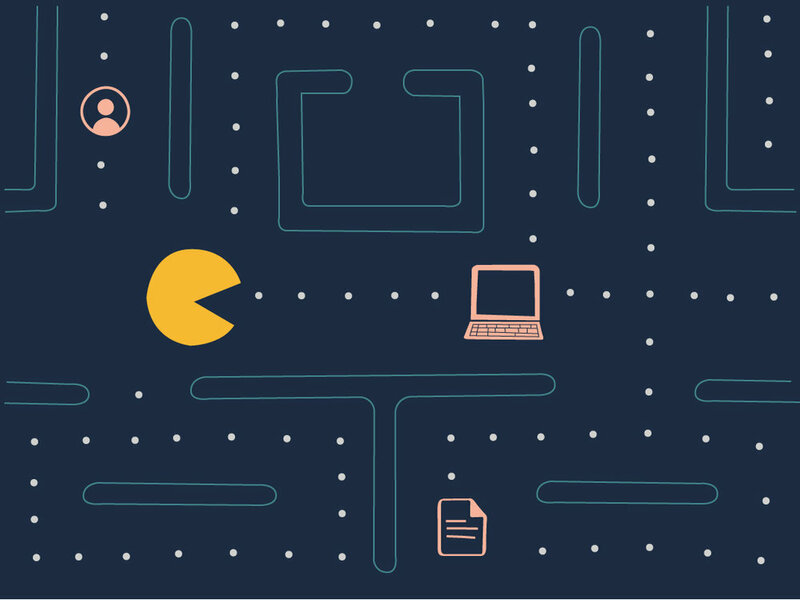 Have you identified the specific business objectives you’re trying to achieve with gamification? For example, your goal may be to reduce time to productivity. Employees might have the complementary goal of feeling capable and confident more quickly or having to ask fewer embarrassing questions during their first week. Most often, your business goals will align nicely with employees’ own goals. By allowing the player to achieve her own goals, your organizational goals can be met as well. It’s also important to define your success metrics upfront. That way, you can ensure you’re capturing the right data for KPI tracking while designing experiences that support their achievement. For example, PwC Hungary wanted to engage job candidates in learning more about the firm before the interview process. To achieve that goal, they designed a targeted game called Multipoly Next, which allows candidates to virtually test their readiness for working at the firm by working in teams to solve real-world problems. The game met both business objectives and candidate needs and resulted in a 190% rise in job applications. New hires found the onboarding experience at PwC much easier since they’d already experienced the culture of the company through the game. If your organization sees potential in using gamification at the start of your employees’ journey, then consider how else could it be used at other times to enhance the rest of the employee journey. A great example is how Walmart used gamification to deliver safety training to 75,000 workers. Consider weaving the same game mechanics you use in onboarding through other key employee touchpoints like recruiting, ongoing training, performance management, employee rewards programs, learning and development, and even off-boarding and alumni programs. At technology company Atlassian, they show all employees where they are in the “rankings” of employees overall based on start date. When they redesigned their internal directory, keeping this was the most-requested feature. People love seeing themselves move out of the “new starters” group over time and can literally see themselves progressing through their careers. Do your research. Find out what motivates your new starters, what information they’re interested in learning, and how other employees factor into their onboarding experience. Reward successes. Consider both tangible and intangible rewards, and make sure you’re providing both. Know what outcomes you want to achieve. Align your business goals with employees own goals before designing your solution. As long as you remember to empathize with your new hires, you can design effective onboarding that uses gamification to enhance the experience. This article was originally published in the Hays Talent Solutions blog.